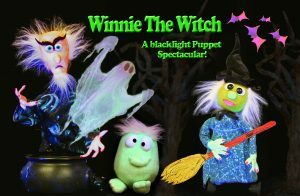 A Black-Light Puppet Spectacular!Winnie the Witch Loves Halloween, especially the candy! One her way to pick up sweets on Candy Island she discovers Willard the Wizard trying to ruin Halloween by making the World’s Candy Supply taste like Brussels sprouts. With the help of the audience and her trusty broomstick, Winnie must dodge Dancing Ghosts, Batty Bats and Silly Skeletons to save Halloween! The Puppet Art Theater Company performs hundreds of live performances for family audiences each year. Their shows tour to theaters, festivals, and public events all over California. Copyright © 2019 Puppet Art Theater Co.